I like this image very much and found the text to go with it. It is from the 46th chapter of Krsna The Supreme Personality of Godhead. We have posted the entire chapter for anyone who has the time or inclination to read it. Enjoy! …When the gopīs understood that Uddhava had a message from Kṛṣṇa, they became very happy and called him to a secluded place to sit down. They wanted to talk with him very freely and did not want to be embarrassed before unknown persons. They began to welcome him with polite words, in great submissiveness. …Uddhava understood that the gopīs of Vṛndāvana were all simply absorbed in the thought of Kṛṣṇa and His childhood activities. While talking about Kṛṣṇa with Uddhava, they forgot all about their household business. They even forgot about themselves as their interest in Kṛṣṇa increased more and more. When the gopīs saw Uddhava, they observed that his features almost exactly resembled the features of Kṛṣṇa, and they could understand that he was a great devotee of Kṛṣṇa’s. His hands were very long, and his eyes were just like the petals of the lotus flower. He was dressed in yellow colored garments and wore a garland of lotus flowers. His face was very beautiful. Having achieved the liberation of sārūpya and having the same bodily features as the Lord, Uddhava looked almost like Kṛṣṇa. In Kṛṣṇa’s absence, the gopīs had been coming dutifully to visit mother Yaśodā’s house early in the morning. They knew that Nanda Mahārāja and mother Yaśodā were always griefstricken, and they had made it their first duty to come and pay their respects to the most exalted elderly personalities of Vṛndāvana. Seeing the friends of Kṛṣṇa, Nanda and Yaśodā would remember Kṛṣṇa Himself and be satisfied, and the gopīs also would be pleased by seeing Nanda and Yaśodā. When the gopīs saw that Uddhava was representing Kṛṣṇa even in his bodily features, they thought that he must be a soul completely surrendered unto the Supreme Personality of Godhead. They began to contemplate, “Who is this boy who looks just like Kṛṣṇa? He has the same eyes like lotus petals, the same raised nose and beautiful face, and he is smiling in the same way. In all respects he is resembling Kṛṣṇa, Śyāmasundara, the beautiful dark boy. He is even dressed exactly like Kṛṣṇa. Where has this boy come from? Who is the fortunate girl who has him for her husband?” Thus they all talked among themselves. They were very anxious to know about him, and because they were simply unsophisticated village girls, they surrounded Uddhava. When the gopīs understood that Uddhava had a message from Kṛṣṇa, they became very happy and called him to a secluded place to sit down. They wanted to talk with him very freely and did not want to be embarrassed before unknown persons. They began to welcome him with polite words, in great submissiveness. “We know that you are a most confidential associate of Kṛṣṇa and that He has therefore sent you to Vṛndāvana to give solace to His father and mother. We can understand that family affection is very strong. Even great sages who have taken to the renounced order of life cannot give up family members. Kṛṣṇa has therefore sent you to His father and mother; otherwise He has no further business in Vṛndāvana. He is now in town. What does He have to know about Vṛndāvana Village or the cows’ pasturing grounds? These things are not at all useful for Kṛṣṇa because He is now a man in the city. “Surely He has nothing to do with persons who do not happen to be His family members. Why should one bother about those who are outside the family, especially and specifically those who are attached as the wives of others. Kṛṣṇa is interested in them as long as there is a need of gratification, like the bumblebees who have interest in the flowers as long as they want to take the honey out of them. It is very natural and psychological that a prostitute does not care for her paramour as soon as he loses his money. Similarly, when the citizens find that a government is incapable of giving them full protection, they leave the country. A student, after finishing his education, gives up his relationship with the teacher and the school. A rich man, after taking his reward from his worshiper, gives him up. When the fruit season is over, the birds are no longer interested in the tree. Just after eating in the house of a lord, the guest gives up his relationship with the host. After a forest fire, when there is a scarcity of green grass, the deer and other animals give up the forest. 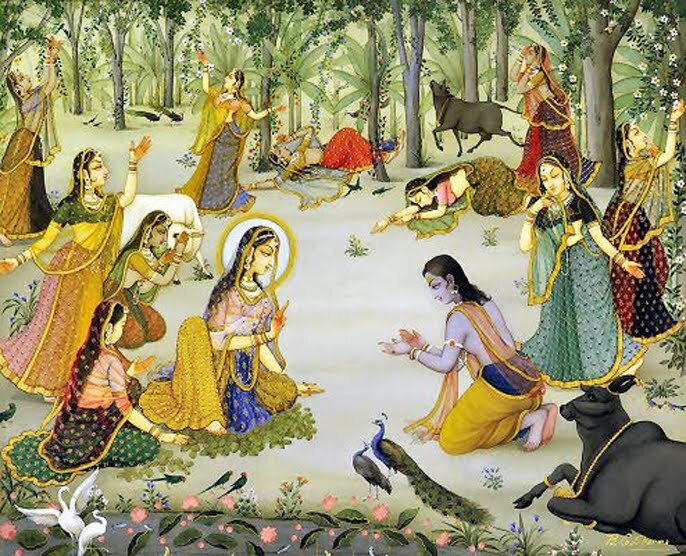 And so a man, after enjoying his girl friend, gives up his connection with her.” In this way, all the gopīs began to indirectly accuse Kṛṣṇa by citing so many similes. Uddhava understood that the gopīs of Vṛndāvana were all simply absorbed in the thought of Kṛṣṇa and His childhood activities. While talking about Kṛṣṇa with Uddhava, they forgot all about their household business. They even forgot about themselves as their interest in Kṛṣṇa increased more and more. One of the gopīs, namely Śrīmatī Rādhārāṇī, was so much absorbed in thoughts of Kṛṣṇa by dint of Her personal touch with Him that She actually began to talk with a bumblebee which was flying there and trying to touch Her lotus feet. While another gopī was talking with Kṛṣṇa’s messenger Uddhava, Śrīmatī Rādhārāṇī took that bumblebee to be a messenger from Kṛṣṇa and began to talk with it as follows. “Bumblebee, you are accustomed to drinking honey from the flowers, and therefore you have preferred to be a messenger of Kṛṣṇa, who is of the same nature as you. I have seen on your moustaches the red powder of kuṅkuma, which was smeared on the flower garland of Kṛṣṇa while He was pressing the breast of some other girl who is My competitor. You are feeling very proud by touching that flower, and your moustaches have become reddish. You have come here carrying a message for Me. You are anxious to touch My feet. But My dear bumblebee, let me warn you–don’t touch Me! I don’t want any messages from your unreliable master. You are the unreliable servant of an unreliable master.” It may be that Śrīmatī Rādhārāṇī purposely addressed that bumblebee sarcastically in order to criticize the messenger Uddhava. Indirectly, Śrīmatī Rādhārāṇī saw Uddhava as not only resembling Kṛṣṇa’s bodily features but as being equal to Kṛṣṇa. In this way She indicated that Uddhava was as unreliable as Kṛṣṇa Himself. Śrīmatī Rādhārāṇī wanted to give specific reasons why She was dissatisfied with Kṛṣṇa and His messengers. According to expert opinion, Lakṣmī, the goddess of fortune is a subordinate expansion of Śrīmatī Rādhārāṇī. As Kṛṣṇa has numerous expansions of Viṣṇu-mūrtis, so His pleasure potency, Rādhārāṇī, also has innumerable expansions of goddesses of fortune. Therefore the goddess of fortune, Lakṣmījī, is always anxious to be elevated to the position of the gopīs. Śrīmatī Rādhārāṇī continued: “You foolish bumblebee, you are trying to satisfy Me and get a reward by singing the glories of Kṛṣṇa, but it is a useless attempt. We are bereft of all our possessions. We are away from our homes and families. We know very well about Kṛṣṇa. We know even more than you. So whatever you make up about Him will be old stories to us. Kṛṣṇa is now in the city and is better known as the friend of Arjuna. He now has many new girl friends, and they are no doubt very happy in association with Him. Because the lusty burning sensation of their breasts has been satisfied by Kṛṣṇa, they are now happy. If you go there and glorify Kṛṣṇa, they may be pleased to reward you. You are just trying to pacify Me by your behavior as a flatterer, and therefore you have put your head under My feet. But I know the trick which you are trying to play. I know that you are a messenger coming from a great trickster, Kṛṣṇa. Therefore please leave Me. “I can understand that you are very expert in reuniting two opposing parties, but at the same time you must know that I cannot place My reliance upon you, nor upon your master Kṛṣṇa. We left our families, husbands, children and relatives only for Kṛṣṇa, and yet He did not feel any obligation in exchange. He has left us for lost. Do you think we can place our faith in Him again? We know that Kṛṣṇa cannot be long without the association of young women. That is His nature. He is finding difficulty in Mathurā because He is no longer in the village among innocent cowherd girls. He is in the aristocratic society and must be feeling difficulty in making friendships with the young girls. Perhaps you have come here to canvass again or to take us there. But why should Kṛṣṇa expect us to return there? He is greatly qualified to entice all other girls, not only in Vṛndāvana or Mathurā, but all over the universe. His wonderfully enchanting smile is so attractive and the movement of His eyebrows so beautiful that He can call for any woman from the heavenly, middle or plutonic planets. Mahā-Lakṣmī, the greatest of all goddesses of fortune, also hankers to render Him some service. In comparison to all these women of the universe, what are we? We are very insignificant. This talk of Rādhārāṇī with the bumblebee messenger and Her accusing Kṛṣṇa, and, at the same time, Her inability to give up talking about Him, are symptoms of the topmost transcendental ecstasy, called mahābhāva. The ecstatic mahābhāva manifestation is possible only in the persons of Rādhārāṇī and Her associates. Great ācāryas like Śrīla Rūpa Gosvāmī and Viśvanātha Cakravartī Ṭhākur have analyzed these mahābhāva speeches of Śrīmatī Rādhārāṇī, and they have described the different sentiments such as udghūrṇā, bewilderment, and jalpapratijalpa, talking in different ways. In Rādhārāṇī is found the science of ujjala, or the brightest jewel or love of God. While Rādhārāṇī was talking with the bee and the bee was flying hither and thither, it all of a sudden disappeared from Her sight. She was in full mourning due to separation from Kṛṣṇa and was feeling ecstasy by talking with the bee. But as soon as the bee disappeared, She became almost mad, thinking that the messenger-bee might have returned to Kṛṣṇa to inform Him all about Her talking against Him. “Kṛṣṇa must have been very sorry to hear it,” She thought. In this way She was very much overwhelmed with another type of ecstasy. The written message which Uddhava brought from Kṛṣṇa was not delivered to the gopīs by Uddhava, but he personally read it before them. The message was very gravely written, so that not only the gopīs, but all empiric philosophers might understand how pure love of God is intrinsically integrated with all the different energies of the Supreme Lord. From Vedic information it is understood that the Supreme Lord has multi-energies, parāsya śaktir vividhaiva śrūyate. Also, the gopīs were such intimate personal friends of Kṛṣṇa that while He was writing the message for them, He was much moved and could not write distinctly. Uddhava, as the student of Bṛhaspati, had very sharp intelligence, so instead of handing over the written message, he thought it wise to read it personally and explain it to them. This all-pervasiveness of Kṛṣṇa is explained in the Bhagavad-gītā, both in the Ninth and Seventh chapters. Kṛṣṇa is all-pervasive in His impersonal feature; everything is resting in Him, but He is not personally present everywhere. In the Seventh Chapter also, it is stated that the five gross elements, earth, water, fire, air and sky, and the three subtle elements, mind, intelligence, and ego, are all His inferior energies. But there is another, superior energy, which is called the living entity. The living entities are also directly part and parcel of Kṛṣṇa. Therefore Kṛṣṇa is the source of both the material and spiritual energies. He is always intermingled with everything as cause and effect. Not only the gopīs, but all living entities are always inseparably connected with Kṛṣṇa in all circumstances. The gopīs, however, are perfectly and thoroughly in cooperation in their relationship with Kṛṣṇa, whereas the living entities under the spell of māyā are forgetful of Kṛṣṇa. They think themselves as separate identities having no connection with Kṛṣṇa. Love of Kṛṣṇa, or Kṛṣṇa consciousness, is therefore the perfectional stage of real knowledge in understanding things as they are. Our minds can never be vacant. The mind is constantly occupied with some kind of thought, and the subject matter of such thought cannot be outside the eight elements of Kṛṣṇa’s energy. One who knows this philosophical aspect of all thoughts is actually a wise man, and he surrenders unto Kṛṣṇa. The gopīs are the typical example of this perfectional stage of knowledge. They are not simple mental speculators. Their minds are always in Kṛṣṇa. The mind is nothing but the energy of Kṛṣṇa. Actually, any person who can think, feel, act and will cannot be separated from Kṛṣṇa. But the stage in which he can understand his eternal relationship is called Kṛṣṇa consciousness. The diseased condition in which he cannot understand his eternal relationship with Kṛṣṇa is the contaminated stage, or māyā. Since the gopīs are on the platform of pure transcendental knowledge, their minds are always filled with Kṛṣṇa consciousness. For example, as there is no separation between fire and air, so there is no separation between Kṛṣṇa and the living entities. When the living entities forget Kṛṣṇa, they are not in their normal condition. As for the gopīs, because they are always thinking of Kṛṣṇa they are on the absolute stage of perfection in knowledge. 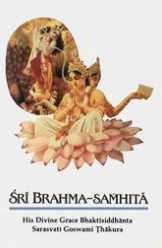 The so-called empiric philosophers sometimes think that the path of bhakti is meant for the less intelligent, but unless the so-called man of knowledge comes to the platform of bhakti, his knowledge is certainly impure and imperfect. Actually, the stage of perfecting one’s eteranl relationship with Kṛṣṇa is love in separation. But that is also illusory because there is no separation. The gopīs were never seperated from Kṛṣṇa. Even from the philosophical point of view, there was no separation. Kṛṣṇa creates, maintains, and annihilates the whole cosmic manifestation by expanding Himself in different incarnations. Everything is Kṛṣṇa, and everything is depending on Kṛṣṇa, but He is not perceived in the material energy. Material energy is called māyā, or illusion. In the spiritual energy, however, Kṛṣṇa is perceived at every step, in all circumstances. This perfectional stage of understanding is present in the gopīs. As Kṛṣṇa is always aloof from the cosmic manifestation, although it is completely dependent on Him, so a living entity is also completely aloof from his material conditional life. The material body has developed on the basis of spiritual existence. In the Bhagavad-gītā the whole cosmic manifestation is accepted as the mother of the living entities, and Kṛṣṇa is the father. As the father impregnates the mother by injecting the living entity within the womb, so all the living entities are injected by Kṛṣṇa in the womb of the material nature. They come out in different bodies according to their different fruitive activities. In all circumstances, the living entity is aloof from this material conditioned life. If we simply study our own bodies, we can understand how a living entity is always aloof from this bodily encagement. Every action of the body is taking place by the interaction of the three modes of material nature. We can see at every moment many changes taking place in bodies, but the spirit soul is aloof from all changes. One can neither create nor annihilate nor interfere with the actions of material nature. The living entity is therefore entrapped by the material body and is conditioned in three stages, namely while awake, asleep and unconscious. The mind is acting through all the three conditions of life; the living entity in his sleeping or dreaming condition sees something as real, and in his awake condition he sees the same thing as unreal. It is concluded, therefore, that under certain circumstances he accepts something as real, and under other circumstances he accepts the very same thing as unreal. These matters are the subject matter of study for the empiric philosopher or the sāṅkhya-yogi. In order to come to the right conclusion, sāṅkhya-yogīs undergo severe austerities and penances. They practice control of the senses and renunciation. All these different ways of determining the ultimate goal of life are compared to rivers. Kṛṣṇa is the ocean. As the rivers flow down toward the ocean, all attempts for knowledge flow toward Kṛṣṇa. After many, many births of endeavor, when one actually comes to Kṛṣṇa, he attains the perfectional stage. Kṛṣṇa says in the Bhagavad-gītā: “All are pursuing the path of realizing Me, but those who have adopted courses without any bhakti find their endeavor very troublesome.” Kleśo ’dhikataras teṣām: Kṛṣṇa cannot be understood unless one comes to the point of bhakti. Three paths are enunciated in the Gītā: karma-yoga, jñāna-yoga and bhakti-yoga. Those who are too addicted to fruitive activities are advised to perform actions which will bring them to bhakti. Those who are addicted to the frustration of empiric philosophy are also advised to realize bhakti. Karma-yoga is different from ordinary karma, and jñāna-yoga is different from jñāna. Ultimately, as stated by the Lord in the Bhagavad-gītā, bhaktya māṁ abhijānāti: only through execution of devotional service can one understand Kṛṣṇa. The perfectional stage of devotional service was achieved by the gopīs because they did not care to know anything but Kṛṣṇa. It is confirmed in the Vedas, yasmin eva vijñāte sarvam eva vijñātam bhavanti. This means that simply by knowing Kṛṣṇa all other knowledge is automatically acquired. The gopīs are in the perfectional stage of meditation. The yogīs are generally more fond of meditation than the execution of devotional service to the Lord, but they do not know that the perfectional stage of devotion is the attainment of the perfection of the yoga system. This constant meditation on Kṛṣṇa by the gopīs is confirmed in the Bhagavad-gītā to be the topmost yoga. Kṛṣṇa knew very well the psychology of women. When a woman’s beloved is away, she thinks of him meditatively, and He is present before her. Kṛṣṇa wanted to teach through the behavior of the gopīs. One who is constantly in trance like the gopīs surely attains the lotus feet of Kṛṣṇa. Lord Caitanya taught people in general the method of vipralambha, which is the method of rendering service unto the Supreme Personality of Godhead in the feeling of separation. The six Gosvāmīs also taught worship of Kṛṣṇa in the feeling of the gopīs in separation. The prayers of Śrīnivāsa Ācārya about the Gosvāmīs explain these matters very clearly. Śrīnivāsa Ācārya said that the Gosvāmīs were always absorbed in the ocean of transcendental feelings in the mood of the gopīs. When they lived in Vṛndāvana they were searching for Kṛṣṇa, crying, “Where is Kṛṣṇa? Where are the gopīs? Where are You, Śrīmatī Rādhārāṇī?” They never said, “We have now seen Rādhā and Kṛṣṇa, and therefore our mission is fulfilled.” Their mission remained always unfulfilled; they never met Rādhā and Kṛṣṇa. At the time of the rāsa dance, those gopīs who could not join the rāsa-līlā with Kṛṣṇa gave up their bodies simply by thinking of Him. Absorption in Kṛṣṇa consciousness by feeling separation is thus the quickest method for attainment of the lotus feet of Kṛṣṇa. By the personal statement of Kṛṣṇa, the gopīs were convinced about the strength of feelings of separation. They were actually experiencing the supernatural method of Kṛṣṇa worship and were much relieved and happy to understand it. The gopīs further expressed that Vṛndāvana was still full of all opulence and good fortune; there was no scarcity or want in Vṛndāvana as far as material necessities were concerned, but in spite of such opulence they could not forget Kṛṣṇa and Balarāma. Uddhava minutely studied the transcendental abnormal condition of the gopīs in their separation from Kṛṣṇa, and he thought it wise to repeat all the pastimes of Śrī Kṛṣṇa over and over again. Materialistic persons are always in a burning condition on account of the blazing fire of material miseries. The gopīs also were burning in a transcendental blazing fire due to separation from Kṛṣṇa. The blazing fire which was exasperating the gopīs, however, is different from the fire of the material world. The gopīs constantly want the association of Kṛṣṇa, whereas the materialistic person wants the advantage of material comforts. It is stated by Viśvanātha Cakravartī Ṭhākur that Kṛṣṇa saved the cowherd boys from the blazing forest fire within a second, while their eyes were closed. Similarly, Uddhava advised the gopīs that they could be saved from the fire of separation by closing their eyes and meditating on the activities of Kṛṣṇa from the very beginning of their association with Him. From the outside, the gopīs could visualize all the pastimes of Kṛṣṇa by hearing the descriptions of Uddhava, and from inside they could remember those pastimes. From the instruction of Uddhava, the gopīs could understand that Kṛṣṇa was not separate from them. As they were constantly thinking of Kṛṣṇa, Kṛṣṇa was also thinking of them constantly while at Mathurā. Uddhava’s messages and instructions saved the gopīs from immediate death, and the gopīs acknowledged the benediction from Uddhava. Uddhava practically acted as the preceptor spiritual master of the gopīs, and they in return they worshiped him as they would worship Kṛṣṇa. It is recommended in authoritative scriptures that the spiritual master should be worshiped on the level of the Supreme Personality of Godhead, because of his being His very confidential servitor, and it is accepted by great authorities that the spiritual master is the external manifestation of Kṛṣṇa. The gopīs were relieved from their transcendental burning condition by realizing that Kṛṣṇa was with them. Internally, they remembered His association within their hearts, and externally Uddhava helped them to appreciate Kṛṣṇa by conclusive instructions. The Supreme Personality of Godhead is described in the scriptures as adhokṣaja, which indicates that He is beyond the perception of all material senses. Although He is beyond the perception of material senses, He is present in everyone’s heart. At the same time, He is present everywhere by His all-pervasive feature of Brahman. All three transcendental features of the Absolute Truth (Bhagavān the Personality of Godhead, Paramātmā the localized Supersoul, and the all-pervasive Brahman) can be realized simply by studying the condition of the gopīs in their meeting with Uddhava, as described by the Śrīmad-Bhāgavatam. It is said by Śrīnivāsa Ācārya that the six Gosvāmīs were always merged in thoughts of the activities of the gopīs. Caitanya Mahāprabhu has also recommended the gopīs’ method of worship of the Supreme Personality of Godhead as superexcellent. Śrīla Śukadeva Gosvāmī has also recommended that anyone who hears from the right source about the dealings of the gopīs with Kṛṣṇa and who follows the instructions will be elevated to the topmost position of devotional service and will be able to give up the lust of material enjoyment. All the gopīs were solaced by the instruction of Uddhava, and they requested him to stay in Vṛndāvana for a few days more. Uddhava agreed to their proposal and stayed with them not only for a few days, but for a few months. He always kept them engaged in thinking of the transcendental message of Kṛṣṇa and His pastimes, and the gopīs were feeling as if they were experiencing direct association with Kṛṣṇa. While Uddhava remained in Vṛndāvana, the inhabitants enjoyed his association. As they discussed the activities of Kṛṣṇa, the days passed just like moments. Vṛndāvana’s natural atmosphere, with the presence of the River Yamunā, its nice orchards of trees decorated with various fruits, Govardhana Hill, caves, blooming flowers–all combined to inspire Uddhava to narrate Kṛṣṇa’s pastimes. The inhabitants enjoyed Uddhava’s association in the same way as they enjoyed the association of Kṛṣṇa. Śrī Uddhava confirmed the statement of Bhagavad-gītā spoken by Lord Kṛṣṇa; one who takes shelter of Him for the right purpose, be he a śūdra or lower, will attain the highest goal of life. The gopīs have set the standard of devotion for the whole world. By following in the footsteps of the gopīs by constantly thinking of Kṛṣṇa, one can attain the highest perfectional stage of spiritual life. The gopīs were not born of any highly cultured family; they were born of cowherd men, and yet they developed the highest love of Kṛṣṇa. For self-realization or God realization there is no need to take birth in a high family. The only thing needed is ecstatic development of love of God. In achieving perfection in Kṛṣṇa consciousness, no other qualification is required than to be constantly engaged in the loving service of Kṛṣṇa. Kṛṣṇa is the supreme nectar, the reservoir of all pleasure. The effect of taking up Kṛṣṇa consciousness is just like that of drinking nectar; with or without one’s knowledge, it will act. The active principle of Kṛṣṇa consciousness will manifest itself everywhere; it does not matter how and where one has taken his birth. Kṛṣṇa will bestow His benediction upon anyone who takes to Kṛṣṇa consciousness, without any doubt. The supreme benediction attained by the gopīs in spite of their being born in the family of cowherd men was never attained even by the goddess of fortune herself, and certainly not by the denizens of heaven, though their bodily forms are like lotuses. The gopīs are so fortunate that during rāsa-līlā Kṛṣṇa personally embraced them with His arms. Kṛṣṇa kissed them face to face. Certainly it is not possible for any women in the three worlds to achieve this except the gopīs. Uddhava appreciated the exalted position of the gopīs and wished to fall down and take the dust of their feet on his head. Yet he did not dare to ask the gopīs to offer the dust from their feet; perhaps they would not be agreeable. He therefore desired to have his head smeared with the dust of the gopīs’ feet without their knowledge. He desired to become only an insignificant clump of grass or herbs in the land of Vṛndāvana. The gopīs were so much attracted to Kṛṣṇa that when they heard the vibration of His flute, they instantly left their families, children, honor and feminine bashfulness and ran towards the place where Kṛṣṇa was standing. They did not consider whether they were passing over the road or through the jungles. Imperceptibly, the dust of their feet was bestowed on small grasses and herbs of Vṛndāvana. Not daring to place the dust of the gopīs’ feet on his own head, Uddhava aspired to have a future birth in the position of a clump of grass and herbs. He would then be able to have the dust of the gopīs’ feet. Uddhava appreciated the extraordinary fortune of the gopīs, who relieved themselves of all kinds of material contamination by placing on their high, beautiful breasts the lotus feet of Kṛṣṇa, which are not only worshiped by the goddess of fortune, but by such exalted demigods as Brahmā and Lord Śiva, and which are meditated on by great yogīs within their hearts. Thus Uddhava desired to be able to constantly pray to be honored by the dust of the gopīs’ lotus feet. The gopīs’ chanting of the transcendental pastimes of Lord Kṛṣṇa has become celebrated all over the three worlds. After living in Vṛndāvana for some days, Uddhava desired to go back to Kṛṣṇa, and he begged permission to leave from Nanda Mahārāja and Yaśodā. He had a farewell meeting with the gopīs, and taking permission of them also, he mounted his chariot to start for Mathurā. When Uddhava was about to leave, all the inhabitants of Vṛndāvana, headed by Mahārāja Nanda and Yaśodā, came to bid him good-bye and presented him with various kinds of valuable goods secured in Vṛndāvana. They expressed their feelings with tears in their eyes due to intense attachment for Kṛṣṇa. All of them desired benediction from Uddhava. They desired always to remember the glorious activities of Kṛṣṇa and wanted their minds to be always fixed upon His lotus feet, their words always engaged in glorifying Kṛṣṇa, and their bodies always engaged in bowing down and constantly remembering Him. This prayer of the inhabitants of Vṛndāvana is the superexcellent type of self-realization. The method is very simple: to fix the mind always on the lotus feet of Kṛṣṇa, to talk always of Kṛṣṇa without passing on to any other subject matter, and to engage the body in Kṛṣṇa’s service constantly. Specifically in this human form of life, one should engage his life, his resources, words and intelligence for the service of the Lord. Such kinds of activities only can elevate a human being to the highest level of perfection. This is the verdict of all authorities. The inhabitants of Vṛndāvana said: “By the will of the supreme authority and according to the results of our own work, we may take our birth anywhere. It doesn’t matter where we are born, but our only prayer is that we may simply be engaged in Kṛṣṇa consciousness.” A pure devotee of Lord Kṛṣṇa never desires to be promoted to the heavenly planets, or even to Vaikuṇṭha or Goloka Vṛndāvana, because he has no desire for his own personal satisfaction. A pure devotee regards both heaven and hell to be on an equal level. Without Kṛṣṇa, heaven is hell; and with Kṛṣṇa, hell is heaven. When Uddhava had sufficiently honored the worship of the pure devotees of Vṛndāvana, he returned to Mathurā and to his master, Kṛṣṇa. After offering respects by bowing down before Lord Kṛṣṇa and Balarāma, he began to describe the wonderful devotional life of the inhabitants of Vṛndāvana. He presented all of the gifts given by the inhabitants of Vṛndāvana to Vasudeva, the father of Kṛṣṇa, and Ugrasena, the grandfather of Kṛṣṇa.